The Cincinnati Reds opened the 2014 season yesterday with a shutout loss to the St. Louis Cardinals. It was the first time they’d been shutout on opening day since 1953. 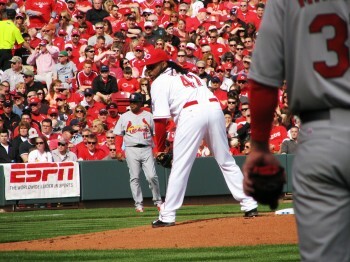 Johnny Cueto started for the Reds and was excellent. Following a trainer’s visit to the mound in the first inning, Cueto was almost unhittable. His only hiccup was in the seventh inning when he allowed a solo home run to Yadier Molina. After that, the bullpen of Manny Parra and Logan Ondrusek took over, shutting out the Cardinals for the rest of the game. Unfortunately, all that excellent pitching was wasted. The offense from the latter days of the 2013 season was in full force, as the team managed just three hits and no runs. This lack of production despite the Cardinals committing three errors, as if they were daring the Reds to take advantage. The final tally of Opening Day 2014. The series continues on Wednesday after a break today, with Michael Wacha taking on Homer Bailey at 7:10pm.